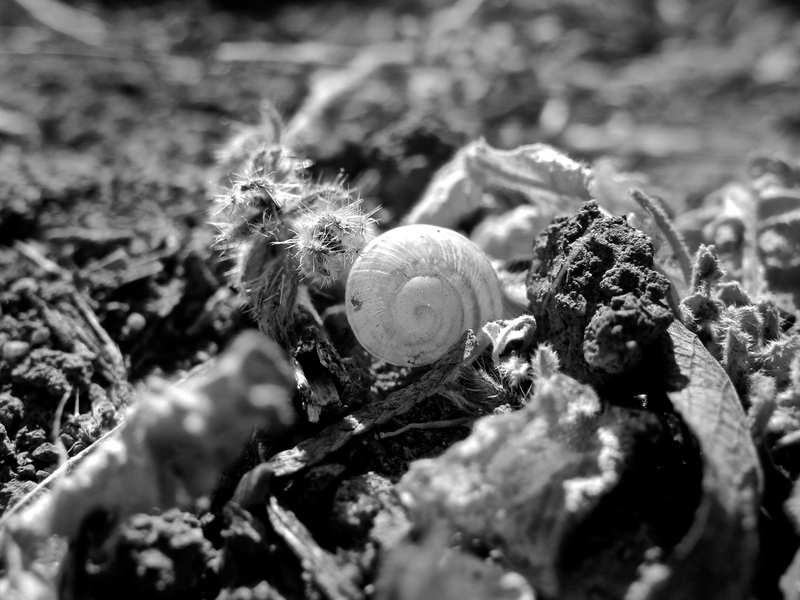 Gnarled fiddleneck fingers grasp vapid seed husks and scratch at the bleached surface of the coiled empty spirals of the snail shell which lies deserted and discarded among the rubble. Dried leaves; thorny and prickled still look to grab hold when they connect with something soft, yet theirs is not a living connection. Like velcro, prickles cross and they stick to one other. The dried dirt clod is marked with fissures from moisture long evaporated and grooves made from sprouts long finished growing. They are an odd assortment of husks, empty shells and dried bits of weeds that were left behind to form a group when the life that fueled them suddenly moved on. The faintest breeze sets all the dried things clattering against one another, making noise in remembrance of spring and blossoms and growth. I see these mementos and they are treasures that withstood change and departure, and here they still remain. They are markers of life, monuments and memorials. When green, moist and pliant they held promises of life with many gifts. Now dried and empty, they proclaim the promise that life will come again. As certain as the seasons fall into one another, as true as the sun’s rising and setting, life will continue. Thank you dear weed remnants, and companion shell, for helping me to hold onto a memory today, and for enabling me to envision a future spring. Thank you so very much Aina! How poetically you expressed yourself.